The bag I chose for review is the Domke Next Generation Metro Messenger Bag from Tiffen. This particular bag (pictured right) that I reviewed is a photographer “gig” bag for me. Sure you can haul just about anything in it, including a laptop and accessories. But I’m an avid photographer who carries a camera, multiple lenses, and multiple camera bodies, and sometimes multiple cameras with me. I also throw in my battery charger, a flash unit or two, small lights, various cables, and even film (Yes, film. Don’t judge me). This bag can hold more than you can carry–trust me on that point. I’ve filled it so full and with so many different things that I’m sure the people behind me at the airport were rolling their eyes and taking some heavy sighs at the spectacle. Watching me pull out so much stuff from that bag–I’m sure I looked like a guy pulling clowns out of a Volkswagen at a rodeo. But I don’t care. The bag is capable of holding my stuff, so I’m going to take advantage of its capacity. The Metro Messenger bag is one tough cookie too. It’s made of Cordura, which is a military-grade nylon blend fabric that’s used to make backpacks, duffle bags, and other stuff for the military. It’s also the material that’s used to make a lot of the new lightweight, super durable luggage that you see in department stores. I chose the Metro Messenger because not only does it not look like a standard issue photographer’s bag, it can double, as I wrote earlier, as a laptop or other type of tote. The Messenger style bag has a good look for me that’s somewhere between briefcase/satchel and small suitcase. I don’t want to feel like I’m carrying a purse/murse nor do I want to look like I’m toting a really fancy diaper bag. That’s why I chose the evergreen style of the Metro Messenger. It’s classic, smart, and professional without being stuffy or pretentious. You can also tell that this is a substantial bag. In other words, it isn’t some cheap knockoff of a bag that you really want. It IS the bag that you really want without paying the big price for it. Now you might say that $349.95 isn’t inexpensive, but I’d tell you that you’ll probably never have to buy another one unless it’s a gift for someone. In other words, you’ll likely never have to replace it, so $349.95 is a steal, even if you keep it for just ten years, but you’ll keep it longer because it won’t wear out. NEXT GENERATION brings evolutionary and revolutionary features to the trusted name of Domke. The Metro Messenger (the grandchild of the F-832) is part of the Metro Series of Satchels, Courier and Messenger Bags. The Metro Messenger , with functionality as the core design inspiration, integrates our patent pending systems for personalizing, protecting and accessing your valuable gear. Also available in RuggedWear Black and RuggedWear Military. Domke GearProtex Insert System – a revolutionary, customizable insert system that allows you to compartmentalize and organize your contents to create any size or shape using bendable, self-adhering separators. Domke PocketFlex Pocket and Pouch System – an ingenious system of movable, pockets, patches and pouches. These innovative storage components adhere to all interior surfaces, personalizing your storage. Why it’s Frugal: The Domke Metro Messenger bag by Tiffen is frugal because it will quite possibly outlast you. I’m pretty sure that if you amortize the price over 20 years, you’ll see that for less than $1.50 per month is a great deal. The bag is tough, attractive, and functional. And it could become an heirloom. What else do you need? The only negative about this bag is that it only has a shoulder strap and no handle on the top. I don’t always want to shoulder a bag, but it’s required with this one. Yes, it’s a messenger bag, but a top handle would be a very welcome design addition to this near perfect product. 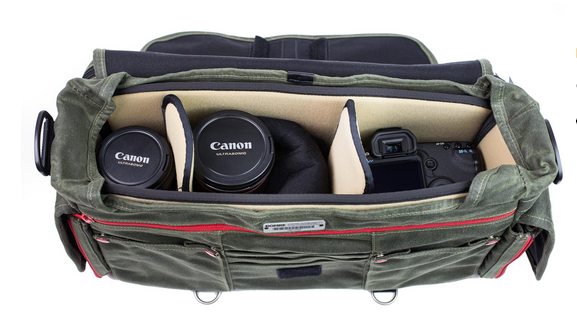 The Metro Messenger is a fine bag and one that any photographer would be proud to carry and to use. Its attention to detail shows me that a professional photographer or two were consulted in the design process. The bag is functional, lightweight, customizable, user friendly, stylish, and can hold more gear than you can comfortably carry. 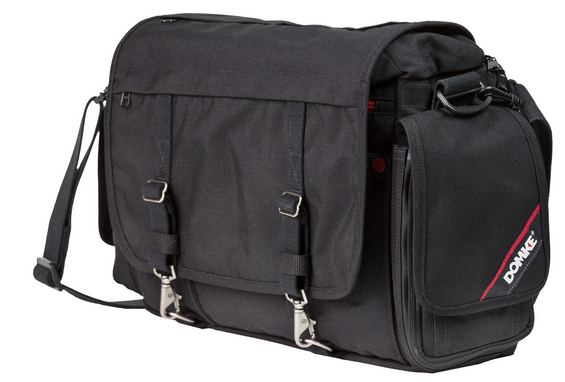 I highly recommend the Domke Metro Messenger bag to any multi-camera toting amateur, semi-professional, photographer’s assistant, and pro photographer. It’s a great all around bag and perfect for carrying equipment for street photography, short films, and outdoor portraiture (I’ve used it for all three, so I know). Recommendation: Buy this bag. It will outlast you.